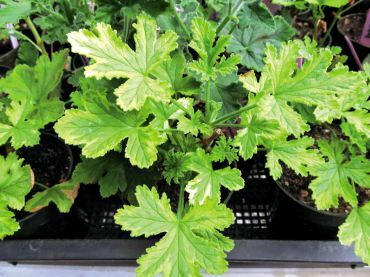 Commonly known as scented geraniums, these are not your ordinary geraniums and definitely not that vibrant summer annual flower that tumbles out of window boxes and container gardens. 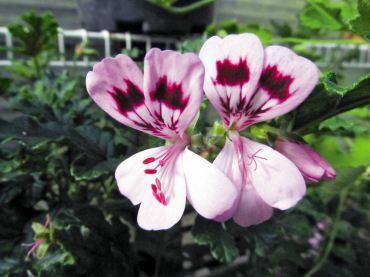 Scented geraniums belong to the genus Pelargonium, like the other geraniums, and all are the family Geraniaceae. They really should be called scented pelargoniums. 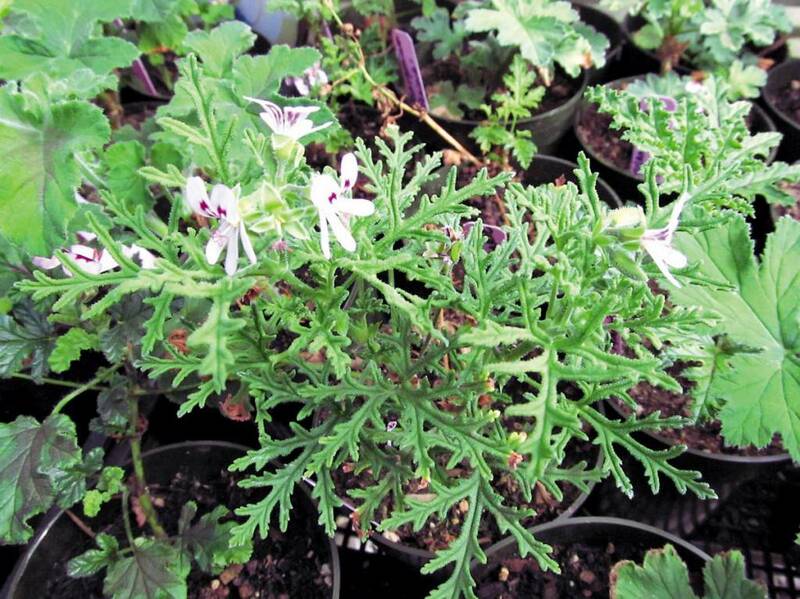 Wild scented pelargoniums are native to the mountainsides in Africa. These are frost sensitive, shrubby plants. Some varieties can grow up to 10 feet in their native environment. They have irregular flower formations and true to their named heritage, have the common “stork” pelargos, seed capsule that resembles a stork’s bill. The flowers are not showy and have irregular blooms of two upper petals and three smaller, lower petals. The leaf form is highly variable and the leaf texture can be smooth, velvety or oily. Rose, lemon, mint, spice and fruity are not usually aromas associated with geraniums. This is a unique quality to these collectable plants. Oil glands on the leaves and stems release fragrance when brushed against, subjected to heat or crushed. 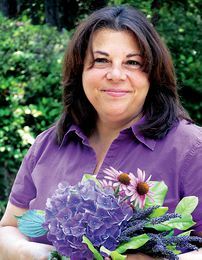 Because scent can be somewhat subjective, no two plant-hunters can smell aromas the same; thus classification of them is an interesting art in the world of identifying, purchasing and finding the plants. Another factor is that they easily hybridize and cross, so many hybridized varieties have come and gone. It seems at times only the nose knows. Most are named by the fragrances gardeners are familiar with. One of the great mysteries of the plant world is the origin of their genetic makeup that allows them to release so many different scents. 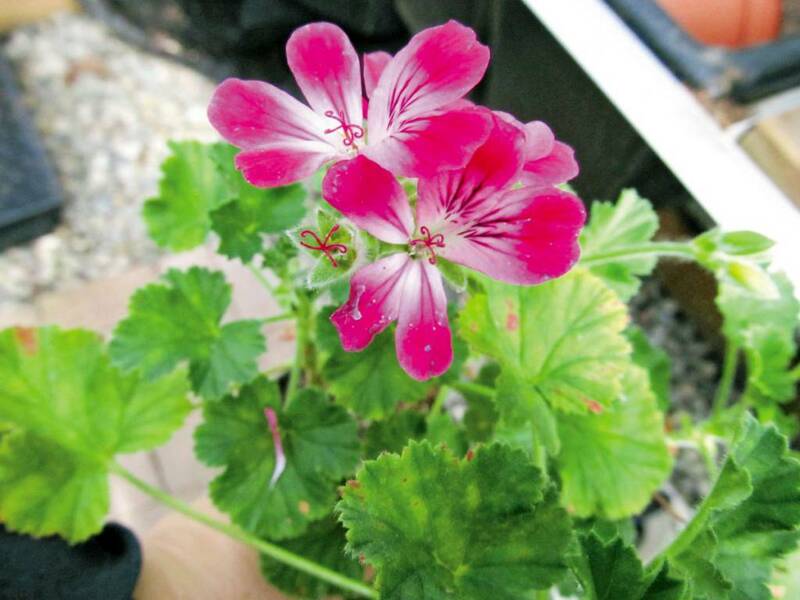 Fragrances of rose, lemon, mint, apples and many combinations — pelargoniums are unique in that they are the only plant species with different aromas. Typically you will find them classified by their scent category: rose, citrus, fruit-scented, mint, spice, pungent. There are more than 250 naturally occurring species of pelargoniums. Native to the Cape of Good Hope in Africa, they were first introduced in Europe in the early 1600s. And by the late 1800s there were more than 150 varieties described in American catalogs. Today, hundreds of named varieties are propagated. Most varieties are tender to frost, with the rose fragrances being hardier. In temperate climates, they can be grown in the landscape along borders and pathways to create texture and garden aromatherapy. 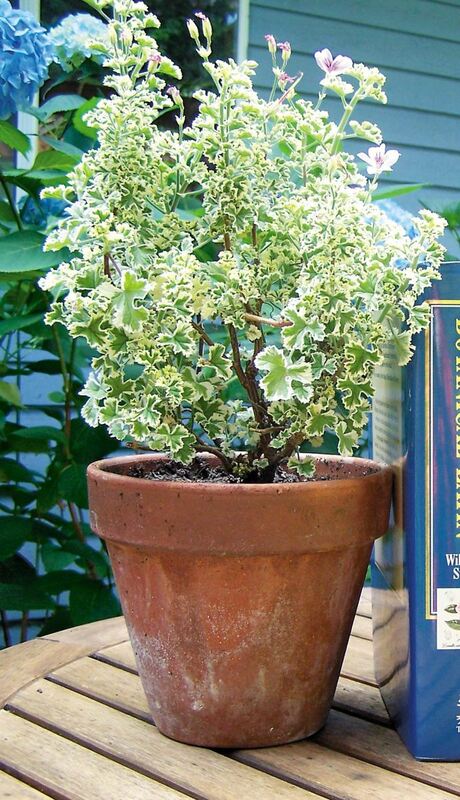 In the Pacific Northwest, they are a popular container plant. 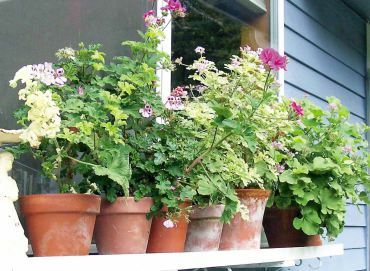 For successful growing, pelargoniums need to be in full sun and rich soil. Choose large, well-draining pots. Keep them evenly moist but not soaked. They are fast-growing and need room in the root area to avoid becoming root-bound before the end of the season. Overwinter them in a protected area. They will take a light frost but not ongoing freezing temperatures. Indoors, pelargoniums can be grown in a warm, sunny window all year long. Scented pelargoniums are plants of many uses, although most are just collected for the fascination of fragrance they emit. In their native Africa, they are a part of potpourris and sleep pillows, and fresh leaves are rubbed on wooden bowls and spoons to give a fragrant polish. They are infused in desserts and sauces as well as teas. The essential oil accumulates in small glands found in the foliage and flowers. Old-fashioned rose or attar of rose (P. graveolens) is the common oil extracted for aromatherapy purposes and has the qualities of an antidepressant, stimulant and antiseptic. It is an astringent and well-reputed as a hormone-balancing herb. In aromatherapy, it is highly regarded as a stress reliever, especially when blended with other relaxing herbs such as lavender and ylang-ylang. For skin care, it is used for healing scars, acnes and wounds. The oil is also used as a base note in soaps, perfumes and creams. In the Victorian tradition of the language of flowers, scented geraniums were popular as fragrant fillers in nosegays. In culinary uses, the rose varieties are used to imart an earthy flavor and aroma to sweet breads, cakes, teas and jellies. The unique leaves are used as a garnish. Combine ingredients well. For a finer blend, ingredients can be ground together. Place in a muslin bag. To use: Place mix in a warm bath. Bathe for a minimum of 15 minutes to capture the full benefits of the herbs. Warm up the vinegar (not to boiling), add geranium leaves, cover and allow steeping, until cool. Strain and bottle. To use: Add 1 cup to the bath. For hair rinse: Add 5 cups of water to the mix and rinse through hair. Heat the jelly slowly over a low heat until liquefied. Add 2 rose geranium leaves and stir. Remove from heat. Let sit for 5 minutes. Remove the leaves. In a clean, sterilized jelly jar, place a fresh geranium leaf in the bottom. Pour jelly over the leaf. Allow to cool; cover and refrigerate. Yummy on plain pound cake or fresh warm scones. Use within a few weeks. Wash the thoroughly dry fresh-herb leaves. Place approximately an inch of sugar in the bottom of a jar. Add a leaf or two, repeat sugar and leaf layers until the jar is full. Let stand up to two weeks. The sugar will be infused with the herbal flavor and can be used in recipes and coffee or tea. Mix the ingredients together. Store in a glass jar. To use: Boil water in a teakettle. Transfer boiling water into a warmed glass or ceramic teapot. Add a teaspoon or two of herb tea mix and allow to steep for at least 10 minutes, longer for stronger tea. Sweeten with honey if desired.